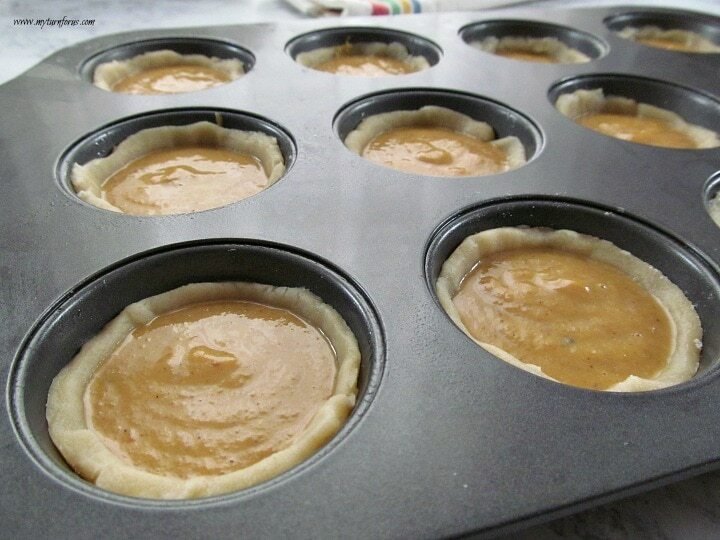 Here’s how to make Mini Pumpkin Pies in a muffin tin. 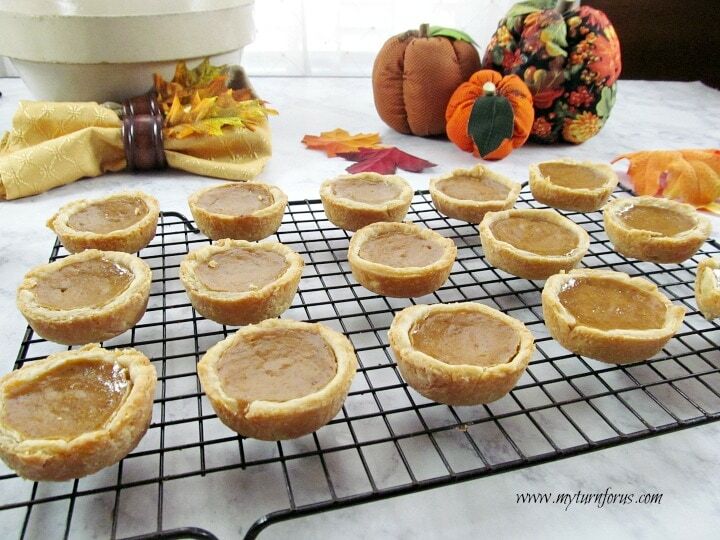 Serve these Muffin Tin mini pumpkin pies and everyone can have their own mini pumpkin pie. Why bake mini pumpkin pies in a muffin tin you ask? Oh, I don’t know but maybe because I wanted to say I can eat an entire pie or two by myself? Or, maybe there are only two of us and the rest of these babies can freeze very easily? Or, maybe because the grandkids are coming over and they love anything mini especially Muffin Tin Pumpkin Pies? 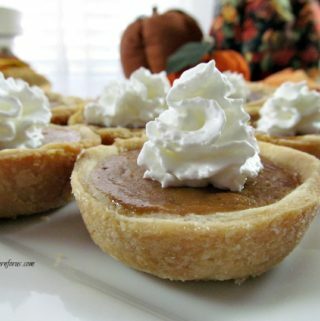 Or, maybe because I find these mini Pumpkin Pies just adorable? The first step in making these adorable little baby pies is with the crust. Whether you are using homemade pie crust dough or store-bought, roll out the dough to about the thickness you wish. It’s your pies, no worries about how thick the dough might, should or could be. 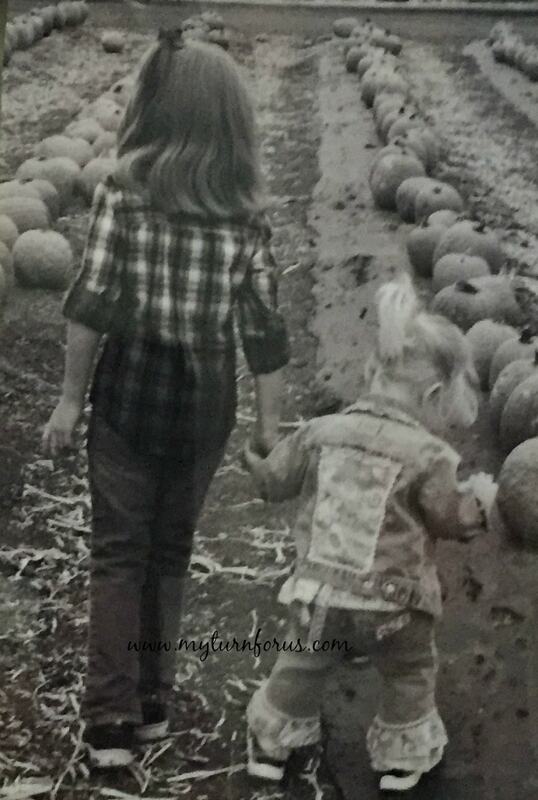 Make them the way you like them! 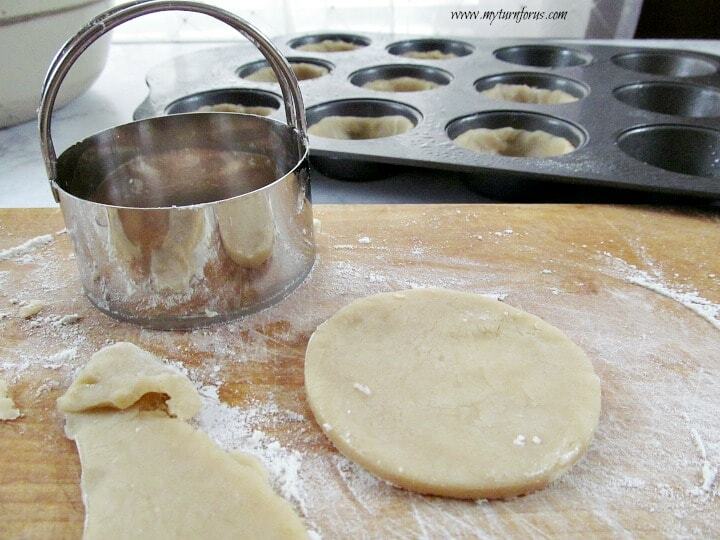 Use a 3-inch biscuit cutter and cut rounds out of the dough. Carefully place each round of dough in each cup of your cupcake pan, making sure the dough comes up the sides of each cup. 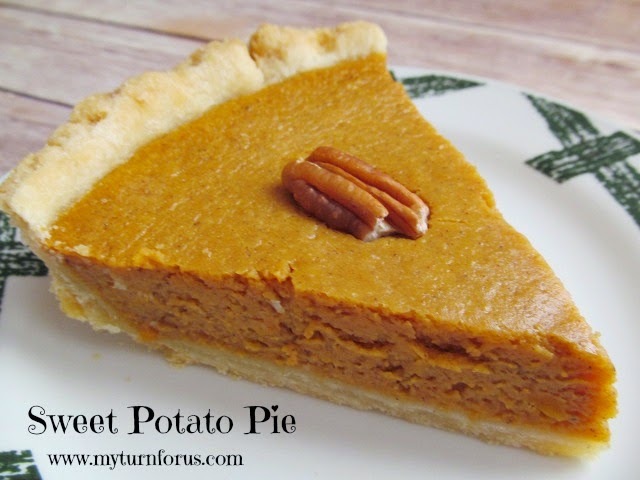 As you pour in the creamy pumpkin filling, make sure to NOT fill them too high, the pumpkin pie filling will rise some and it’s not good if it runs over the top of the little crusts. These muffin tin pumpkin pies are just too cute and no special pan was needed. These pies were baked right in a muffin tin or cupcake pan that most of us already have. I love finding new uses for items I have already purchased. 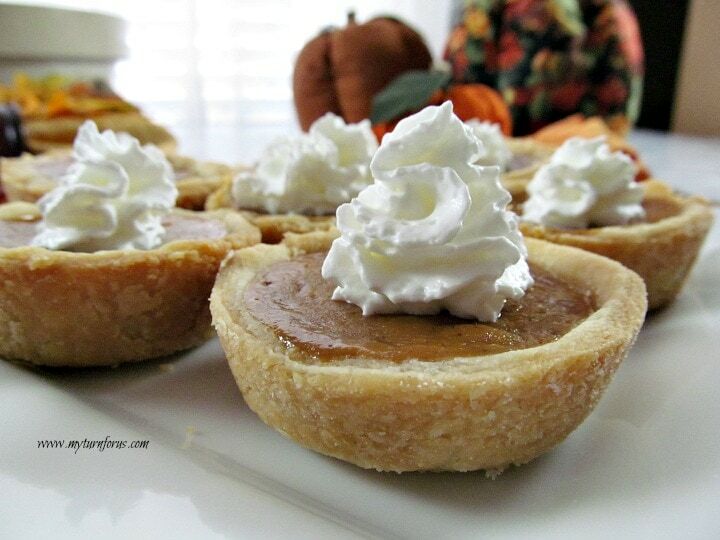 These Mini Pumpkin Pies would be delicious eating while sitting in front of a fire watching it snow outside. They would be darling for any little girls (or big girls) tea party or on any elegant dessert table. 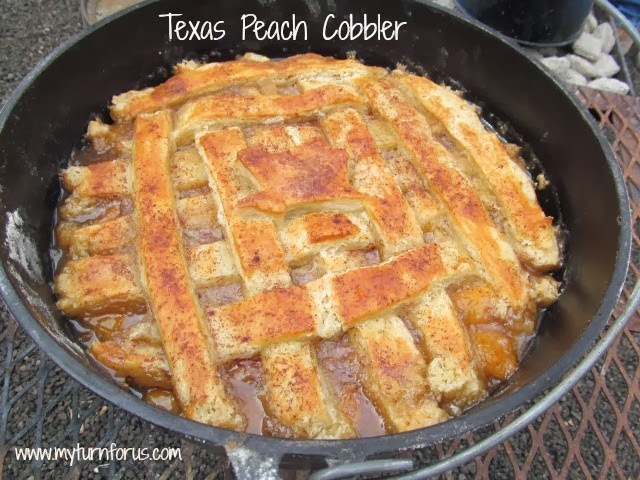 Or why don’t you just bake a few for those days when we need a nice bite of comfort food. I think the answer to questions why we make mini pumpkin pies is basic. 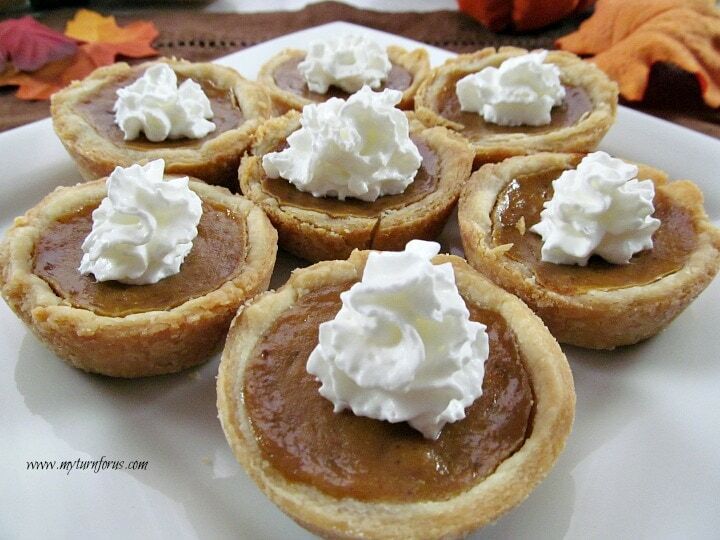 We just need mini pumpkin pies in our life! They are a necessity, not a luxury! In a small bowl, mix sugar, cloves, cinnamon, ginger and nutmeg until blended. 2.. Beat eggs in large mixing bowl, whip in pumpkin, vanilla and sweetened condensed milk. Using a 3-inch round cutter, cut out rounds, rerolling and cutting until all the dough is gone.